About two dozen pilot programs throughout LA Unified are helping prepare the entire district for new, more comprehensive state science tests that fifth-, eighth- and 11th-graders will start taking in 2019. 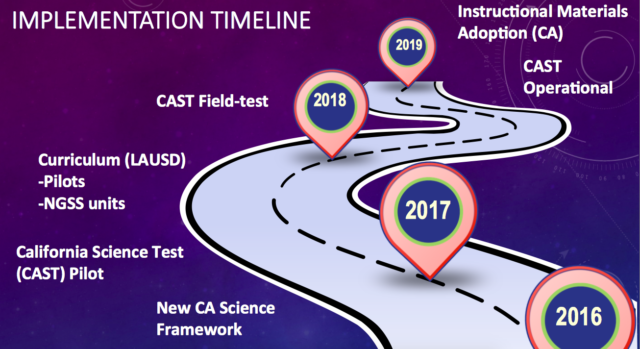 The new California Science Test (CAST) will replace the California Standards Test (CST). It will be taken on computers rather than on paper and will not be all multiple choice questions as in the past, said Derrick Chau, the senior executive director of instruction for the district. “Also, the new tests will be cumulative and will not just cover the material from that grade level,” said Chau, who made a presentation Tuesday to the Curriculum, Instruction and Educational Equity Committee. So, for example, the science tests taken by eighth-graders will include all the science material studied between sixth and eighth grades rather than just the material studied that year. Chau said that in a matter of days the state will release a version of the California Science Framework that will be posted after a series of reviews by instructors. At LA Unified, 90 teachers and administrators are being trained as a Science Leadership Team for the tests based on the Next Generation Science Standards. Those standards, adopted by the State Board of Education in 2013, focus on explanatory ideas and concepts and build coherence across time and between science disciplines. The leadership team will then train at least one teacher at every school to serve as a lead science teacher and help create a new science center at each Local District. LA Unified students should get the instructional material by the 2018-19 school year and be ready to take the tests at the end of the school year in 2019, Chau said. 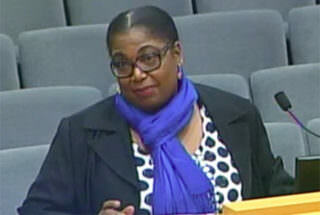 Paulette Donald of Crescent Heights Elementary School. Teacher Paulette Donald told the committee how she teaches science to kindergartners and first-graders in a split class at Crescent Heights Language Arts and Social Justice Elementary School in one of the 23 pilot science programs at the district. “I enjoy teaching this and watching the students actively think of themselves as young scientists,” said Donald, who displayed some of her students’ work. She appoints one student a week to be the class meteorologist to monitor and explain what is going on with the weather and the moon. “They soon realize that science is everywhere around them, and it is refreshing to watch their interest grow,” Donald said. Committee chairman and board member Richard Vladovic complimented Donald on her enthusiasm for teaching and said he believed it could only translate to better test scores.